Happy Monday! It’s officially countdown time until the end of school we have a little under two weeks left. I have so many mixed emotions about this. Kinda sad that this might be Michael’s last year having his summer free. Sports camp and possibly working and having a social life. I can imagine his summer is going to start to get really busy going forward. Last week I tried a yummy homemade jerk chicken recipe. I’m going to try and recreate the recipe and actually take note of the seasoning measurements and not seasoning to taste. The family loved the recipe. I actually made it in the crockpot. The chicken was so tender and flavorful. Per the family. It was nice to create something different and not the same ole same meals. Plus, I love that I was able to create the meal in the crockpot, in the oven or even on the grill. If you don’t own a crockpot. I highly suggest investing in one. It’s such a life saver, especially during the warmer months. Also, I would like to get back into freezer cooking. Freezer cooking used to really come in handy when I would already have the meat marinaded in advance and all I would have to do is thaw it out and put it in the oven, grill or crockpot. As you can see, so many mixed emotions and a lot to add to my to-do list. Ziti with garlic bread is one of my all time favorite meals. I grew up in a big Italian family so we had that A LOT! The Turkey Bacon Cheeseburger sounds like a winner! I love everything on your menu and I need to make a few of your recipes this week. Your jerk chicken sounds interesting and something different for the family. Using a menu planner is such a life saver around our home. My husband would be all over that Garlic Honey Salmon! You have a wonderful week of meals coming up! I am coming over on bake ziti night! I love ziti anyway I can get it it is probably one of my favorite meals with noodles. This definitely looks like a great menu. Now, I am hungry and I loved seeing the list as it has given me new ideals for meals in our home. And I like the ideal of setting up a weekly menu and should start doing that as it would save me time. That garlic honey salmon is calling my name. I need to figure out what I'm wearing this week. Baked ziti is one of my favorites. I think it's a great idea to plan out a menu for the entire week in advance. 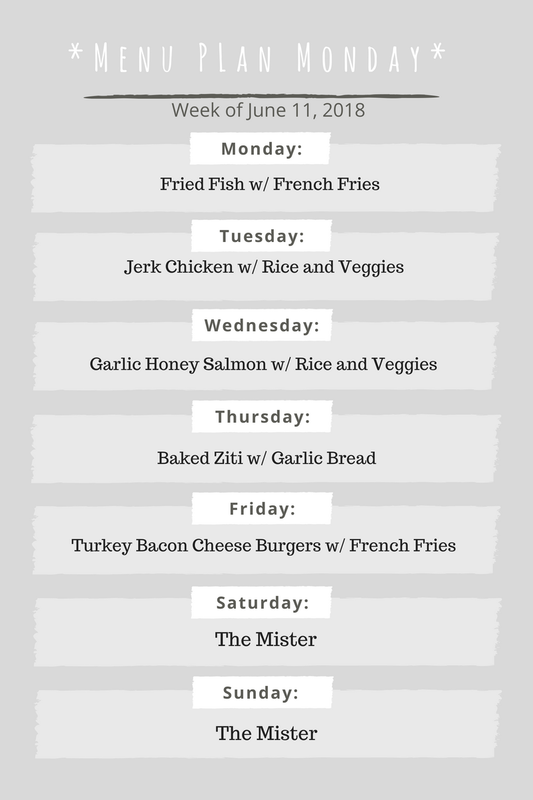 You have planned out a great week of meals. I plan but can only be at the most 3 days ahead. I need to know how this jerk chicken is made. That baked ziti must be a family favorite as I see it listed almost every week. We have a couple of favorite dishes that rotate frequently as well. It all looks good. We have jerk pork on the menu this week at our house. It is a summertime staple. Really excited for what you have this week, especially Tuesday! I love jerk chicken, it's so good and packed with flavor! I'm coming over for Jerk Chicken on Tuesday Night! It's one of my favorite dishes. This week we are dining in ALL week. Tonight it was shrimp and grits. Tomorrow's dish is yet to be determined. Would you invite me to comer on Tuesdays at your home? Lol. Kidding aside, I love the menu with salmon too. You totally had me at ziti! I love this week planned out meal. I need to get a jump start on meal planning, meal prepping, and healthy eating, It would save me so much time. Isn't it so neat and organize to have a list of meal each week? I love this idea it save you so much time to figure out wgat to make. All of it sounds delicious! I totally like The Mister taking control of dinner on the weekends! Wow! This is really dope. I bet your family loves you! During the week I'm eating leftovers are preparing quick meals. However, I do realize that if I prepare in advance. The menu could very well be quick meals. Thanks for sharing. Such a great idea to menu plan! I need to be better at it.